Garage and storage cabinet projects couldn't get any easier. The Slide-Lok storage system consists of 10 storage cabinets and Slat-Wall. Each of Slide-Lok's garage storage products are designed to be mixed, matched and stacked with other Slide-Lok cabinets allowing you to create that perfect storage solution for any room in your home. The Slide-Lok Classic Series is available in four durable thermofused finishes with a natural wood grain look. 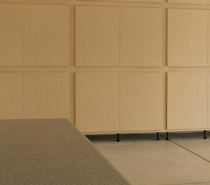 Choose from a host of options such as Slat-Wall and Slat-Wall accessories, flooring and other garage accessories. New options are also available such as a heavy duty metal storage chest and new extruded aluminum handles. Ask your authorized Slide-Lok dealer for more information. Each cabinet system we offer online lists the system's height, width and depth as configured and shown in the garage cabinet system image. Use these dimensions to determine if the system will fit your space.